I hope you all had a wonderful 4th of July celebration, 'cuz we sure did! Did you all see our Row for Row by Row 2016? This year's theme is "Home Sweet Home". We call our row "Home Sweet Home in the Bitterroot". On our website, John also created a really cool video to compliment our Row - check it out! Stop in and pick up our Row by Row pattern or a kit too. Sapphire Quilt Club's Celebration Quilt Show, "The Heart of a Quilter", will be this Friday, July 8th from 10:00am to 6:00pm and Saturday (9th) from 10:00am to 4:00pm in Stevensville. The show will feature a display of over 200 quilts with two featured artists, demonstrations, peoples choice and raffles with door prizes. The featured Quilter is Mary Hayes. While you are there, stop by Patchwork Quilts' booth and say hello to Claudia! Patches 7th Annual Flip Flop Christmas celebration will be held on Friday, July 15th (10:00am to 5:00pm) and Saturday (16th) from 10:00am to 4:00pm. 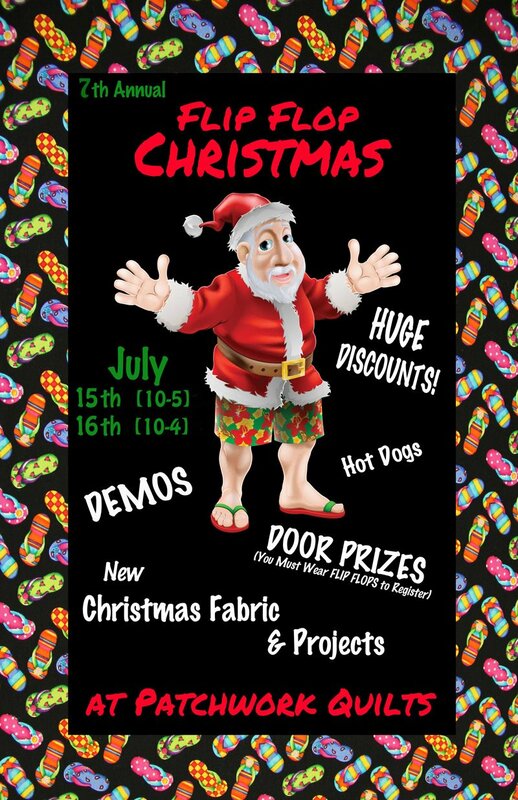 It's always a fun time, full of great discounts, Christmas fabric, demonstrations, hot dogs, door prizes, and yes, Santa in his HO HO HO shorts. So, put your flip flops on and come on down to Patches for a great time!